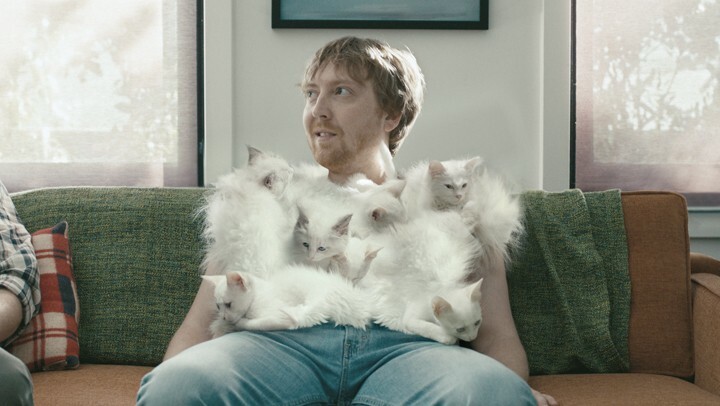 The Kittens ad was developed at The Martin Agency, Richmond, by executive creative director Joe Alexander, group creative director Nancy Hannon, associate creative director/copywriter Andrew Goldin, senior art director Mauricio Mazzariol, group planning director Fritz Kuhn, group strategic planner Dalynn Kincannon, account supervisor Carrie Bird, executive broadcast producer Molly Souter, agency junior producer Amy Marek. Filming was shot by director Rocky Morton via MJZ with director of photography Bill Pope, executive producer Scott Howard and producer Donald Taylor. Editor was Jim Ulbrich at Beast with assistant editor Tripp McCarty. Colorist was Tom Poole at Company 3. Post production was done at Framestore by VFX supervisor David Hulin, 2D lead Maryanne Butler, Paint/Roto team Sabrina Tenore, Alex Ling, Jesse Spielman, producer Graham Dunglinson, executive producer James Razzall. Audio post production was done at Rainmaker Studios by engineer/mixer/sound designer Jeff McManus, and engineer/mixer Mike O’Connor.